Give this Thoughtful Little Sailing Angel to the sailor in your life or to anyone that has dreams of sailing off into the sunset. 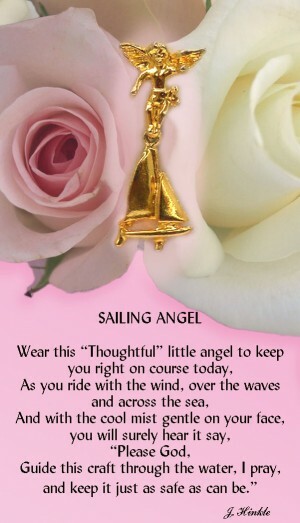 Our Thoughtful Sailing Angel helps protect your sailor and keep them on a steady course. Calm seas and steady winds to guide your sailor home after a wonderful day at sea. As in life, when things are not going as they should try adjusting your sails and set a new course. Give this Thoughtful Little Sailing Angel to the sailor in your life or to anyone that has dreams of sailing off into the sunset. Our Thoughtful Sailing Angel helps protect your sailor and keep them on a steady course. Calm seas and steady winds to guide your sailor home after a wonderful day at sea. As in life, when things are not going as they should try adjusting your sails and set a new course. This angel is layered in 14K gold finish with a free hanging sail boat. Always… Made in America.